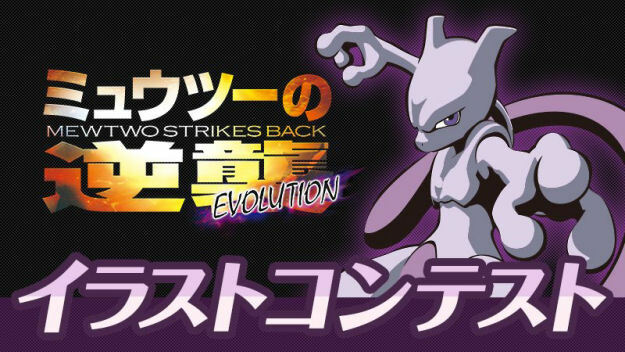 An illustration contest to coincide with the release of Mewtwo Strikes Back Evolution was launched in early 2019. Details about the contest are below. The general idea is that you take one of the templates seen on the left side below, draw fanart around it like the examples on the right, and then send them in. There are three different "themes" for this year's contest. 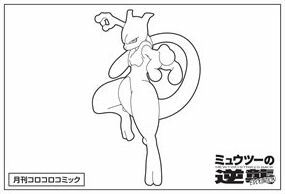 The first theme is an image of Mewtwo in a battle pose. 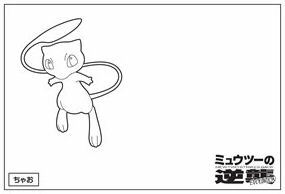 The second theme is an image of a playful Mew. 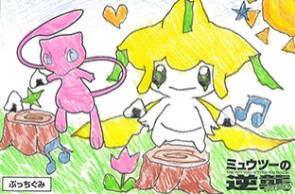 The third one is a free style and can be entered in Sunday Web Every in collaboration with pixiv. A gallery of submissions for this third theme can be found on the pixiv page for this contest. Number of Winners: 12 winners (one for each of the publications listed above) altogether. 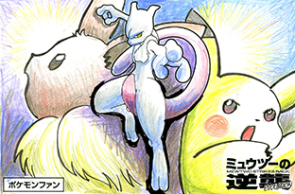 The first part of this prize is that your winning art will be featured during Mewtwo Strikes Back Evolution. In past years this meant either showing the art during or after the film's end credits. 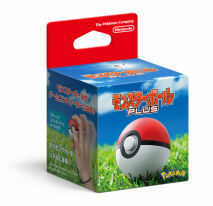 The prizes come couresty of Pokemon. The prizes come coutresy of Takara Tomy. Essentially there are two ways to obtain an entry form. For the first option, participants will need to purchase one of the 11 magazines listed above and draw their art on the postcard inserted in each one. Participants will then need to fill in their name, mailing address, telephone number, gender, age, and the name of a parent / guardian and send it in. The second way is to download the entry form, print it out, draw their art, provide the same name / address / etc. information as above, paste it to the back of a postcard you've bought yourself, and then send it in. And now for the fine print. 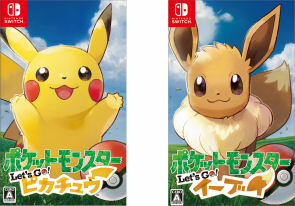 All the winning entries will become the sole property of The Pokémon Company, including all rights granted by Articles 27 and 28 of the Japanese Copyright Law. Additionally, creators agree to forfeit all rights to their winning entries. Submitted entries will not be returned to their creators. 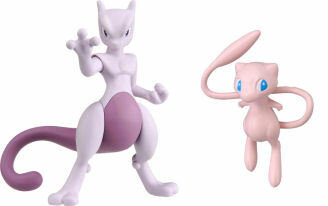 The 12 grand prize winners' names and entries will be revealed during the film Mewtwo Strikes Back Evolution. The runners-up will be announced in each respective magazine as well as the movie's official website.